By Ruth Nolan | There are stories of the Mojave Desert in books, and there are stories of the Mojave Desert’s indigenous people and their long history in this fabled and cherished geography, embedded in the Mojave Desert’s stunning rock spires, sacred caverns, mysterious canyons, and the long, slow, wide-mouthed alluvial fans spilling from these canyons. Such are the stories found in the Old Woman Mountains, a “sky island” mountain range rising from the low desert floor to as high as 5,300 feet in a remote area of eastern San Bernardino County known as the Heart of the Mojave, accessible by humans only via four-wheel-drive vehicle, or a very long hike. There’s the story of the Old Woman Meteorite, the largest meteorite ever found in the United States, which was found here in 1938. There are stories of miners and ranchers, and stories of the desert’s Native American shamans – holy men – praying for visions inside caves, whose ceilings and walls they painted with ochre designs and carved with petroglyphs. There are stories of the fight in the 1990s to stop a nuclear waste site from being built in neighboring Ward Valley, which spills from the alluvial fans of the Old Woman Mountains. This is a deeply storied landscape. And the stories of the Old Woman Mountains continue to unfold, to this day. One such story is one I am part of. It’s a story of the blessing and dedication ceremony that took place this past May 23, on an unseasonably cool and cloud-graced afternoon, where several dozen adults and children representing several desert and other Native American tribes, educators, Bureau of Land Management (BLM) personnel, local ranchers, Sierra Club volunteers, and members of the desert advocacy and protection group, the Native American Land Conservancy (NALC), gathered for a ceremony to dedicate and bless the restoration project at the Old Woman Mountains Preserve, sponsored by the NALC. 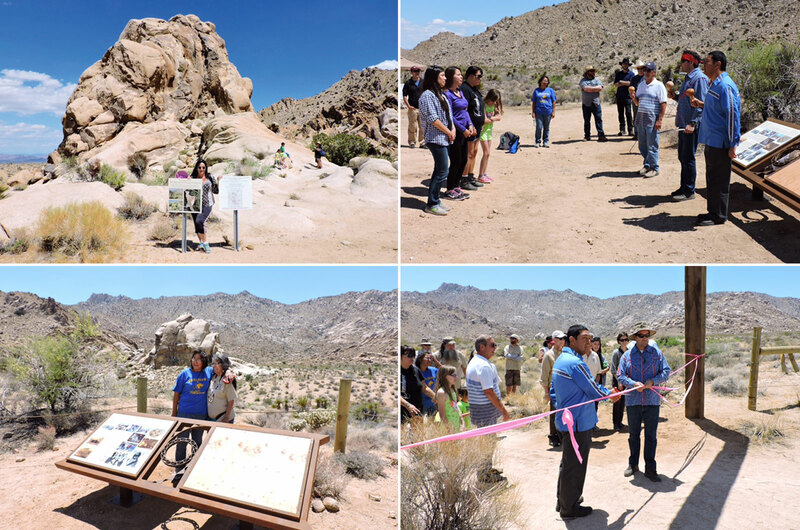 On that day, those who gathered in the Old Woman Mountains in the Heart of the Mojave watched as Anza-Cahuilla tribal member Michael Madrigal and Agua Caliente Tribal Specialist and member Sean Milanovich cut the ribbon across the new entrance gate to the 2,500-acre preserve, which was acquired by the NALC – formed in 1998 – as part of the group’s long-term efforts to protect and preserve Native American traditional cultural properties, as well as to pass along what NALC Executive Director Kurt Russo calls, “the spirit of place” to both native and non-native members. On that day, those who gathered, including members of the desert’s Cahuilla and Chemehuevi tribes, as well as members of the Lummi tribe from the Seattle area, grew silent as Madrigal and Milanovich gathered everyone in a circle, at the base of an area of sacred rocks protected by a newly erected protective fence, and began to perform desert Indian bird songs, using traditional gourd rattles to keep time as a line of dancers standing in front of them followed their lead. According to Russo, the NALC was able to complete the project with a $376,000 grant from the California State Parks Off Highway Motor Vehicle Recreation Division grant program, and more than $100,000 from the Bureau of Land Management. Participants in the reclamation included representatives from the BLM such as Linda Otero; Sierra Club volunteers such as Vicky Hoover and volunteers from other environmental groups; and neighboring private land-owners. “It was a great, inter-agency collaboration,” Russo said. As the vehicle I rode in left the preserve for the rugged four-hour journey home after the blessing ceremony and dedication of the Old Woman Mountains Preserve, I looked to the sky once again. Three huge, red-tailed hawks, the biggest I’ve ever seen, rose into the sky from one of the range’s many peaks, circled above our caravan of SUV’s, looking down on us, then disappeared again into the heart of the Old Woman Mountains. Ruth Nolan, M.F.A., M.A., is a Mojave Desert/Coachella Valley-based author and professor whose writing is grounded in the California desert, where she’s lived for most of her life. She is editor of the critically-acclaimed anthology, No Place for a Puritan: the Literature of California’s Deserts. She is writing a memoir about her work as a wildland firefighter in the California Desert District and Western U.S. for the BLM and USFS in the 1980’s. Her poetry, stories and essays have been published in Rattling Wall, Short Fiction, Los Angeles (Red Hen Press), New California Writing (Heyday), Women’s Studies Quarterly and many other publications. She teaches Creative Writing and Desert Literature at College of the Desert.